Dog agility and rally obedience are the fastest growing dog sports in the world. Both competitions are open to all types of dogs regardless of their pedigree or kennel affiliation. USACS is dedicated to fostering the development and supporting participation in international amateur sports of sport of dog agility and rally obedience. These sports have demonstrated the necessary competitive characteristics requiring dedicated training, conditioning and athleticism. 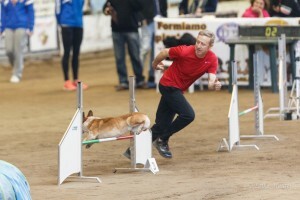 Dog agility is a fast-paced event where teams race against the clock through an obstacle course. In true team fashion – humans and their canine partners together navigate a course filled with jumps, tunnels, slalom weave poles, see-saws, balance beams and A-frames. Similar to equestrian events, teams are faulted for knocking a hurdle bar, running past or refusing an obstacle, skipping a slalom pole or not completing an obstacle in a safe manner. Teams with the fastest time and fewest faults wins. Rally obedience combines agility and obedience into one competition. Taking direction from their human partner on a timed course, competitors must navigate a course set out by the judge, instructing their dogs to execute variety of skills and disciplines, including various heeling patterns at different rates of speed, send-aways and recalls to execute specifically designed exercises and feats. Some include use of props and jumps, adding depth and variety to the skill set performed. To make it to the top of the field and represent the USA, sportsmen and women in cynological sports require hard work, dedication, training, and the ability to train and work skillfully with dogs.